Its coming up on that time of year when we all hopefully go on a little get away during the summer, I hope everyone is going somewhere nice and if not i hope youre enjoying the sun that we have just now. 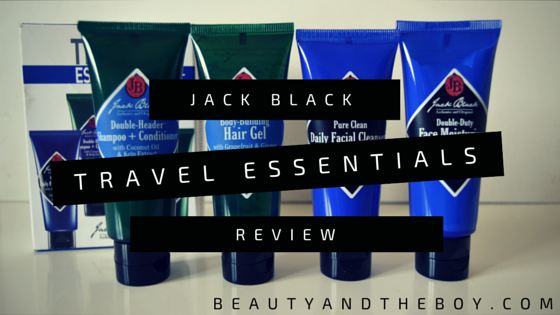 The Jack Black Travel Essentials* set is the perfect thing for those of you that are on the go a lot its perfect for taking with you if you are on business or if you’re on holiday, best part is these are actually quite large tubes they should last multiple uses. Firstly we have the Double Header Shampoo and Conditioner is an all-in-one shampoo and conditioner that works to gently cleanse and detangle the hair whilst hydrating and treating a dandruff-prone scalp. Fortified with a PureScience® formula, the creamy, sulphate-free blend combines creatine with coconut oil and mineral-packed organic kelp to nourish, thicken and strengthen strands. Usually i’m quite wary of products that say 2-in-1 because i find they dont always perform as good as they say they do, I was pretty surprised how well this actually worked a lot of the time if i dont use a conditioner or a mask my hair can feel dry and tangled but with this my hair felt really soft i think that might have to do with the Coconut Oil that’s in it. Then we have the Body-Building Hair Gel which i personally wasn’t a great fan off as it was such a firm hold, i tried blowdrying it into my hair and also using it when my hair was dry but just felt it wasn’t for me but that doesn’t say its a bad product it might be fantastic and a great product for one of you out there. The Body Building Hair Gel is a lightweight styling gel that delivers long-lasting hold with conditioning properties. With a new and improved formula, the non-sticky product combines organic basil leaf, organic kelp and ginger root to add body and fullness whilst nourishing and adding shine. Drying instantly on the hair, the gel will hold your style in place without weighing hair down or leaving unsightly flakes and build-up. I really like the Pure Clean Daily Facial Cleanser it felt like it was actually giving my face a really good cleanse also the scent of the product was really nice as well. I found my skin seemed to look better when this was added into my routine i think mostly because it was cleansing so well that my other products could penetrate the skin better to give better results. Pure Clean Daily Facial Cleanser is 2 in 1 liquid cleanser and toner to remove excess oil, dirt and impurities to leave you with a clear and smooth complexion. Formulated with the PureScience® innovation, it works gently to hydrate and refresh skin and witch hazel and organic chamomile are contained to soothe and reduce redness. Lastly we have the Double-Duty Face Moisturizer SPF 20 which is the product i kind of used the least because i have a moisturizer i really like already so i asked one of my friends to use this product and he said that it left his skin feeling really hydrated (he has dry skin) and it didnt sit on his skin like a lot of other moisturisers for men, it was absorbed really easily, he also liked the fact there was an SPF in it as well for a bit of sun protection. Double-Duty Face Moisturizer SPF 20 is a hydrating cream to improve the skin’s appearance. Blue algae extract provides vitamin E to reduce inflammation and leave skin supple and mineral-rich sea parsley to reduce irritation. Its advanced moisturising complex delivers sun protection to shield skin from exposure to harmful UVA and UVB rays and contains organic antioxidants to promote collagen formation. For only £21 on Mankind.co.uk, i think this is a fantastic set and great value for taking on holiday because you can only carry a certain amount of liquids so this would be great to take with you. Its good as well if you dont want to commit to buying full size products you can bascially try the smaller versions before the more expensive ones. Have you tried Jack Black before? Never heard of these but they look great! Very interesting! You know thats the one product i really want to try the lip balm sounds awesome ive heard so much from people that love it!